Palace Hotel, Ness Walk, Inverness, seen from Castle Hill. Designed by Alexander Ross (1834-1925) in partnership with Robert John Macbeth (1857-1912). 1890. Category B listed. Described in the listing text as being in "Free style," it is a three storey building with an attic and a three-bay frontage. In these respects, it is similar to the neighbouring Columba Hotel, but is considerably more impressive because the central bay is flanked by two matching pyramidal towers, linked below the eaves by a gentle elongated arch marking the main entrance. The windows just below the conical roofs make a very attractive feature, above the bay windows of the lower storeys. John Gifford compares the linked-tower feature with a similar element of Fyvie Castle in Aberdeenshire; perhaps both were inspired by the architecture of French chateaux. At any rate, with this touch of elegance, the Palace makes a fine landmark along this distinguished river walk. 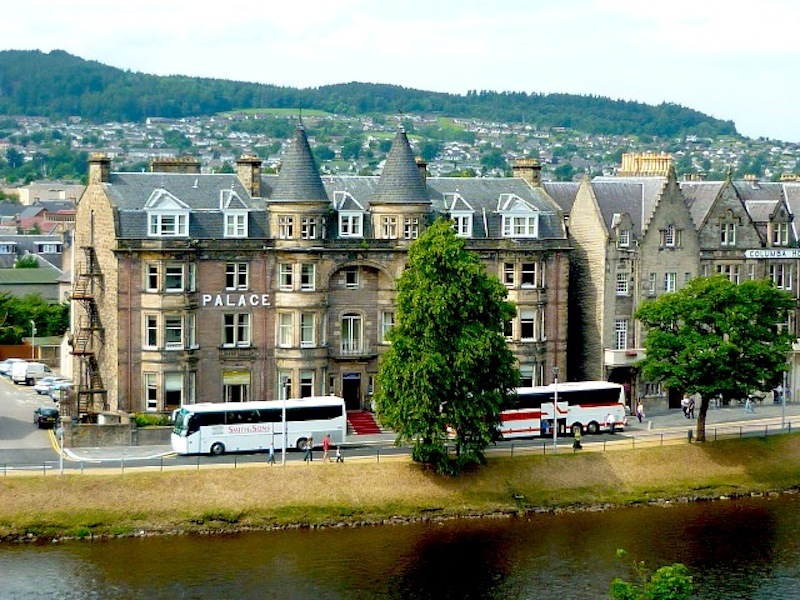 "Inverness, Ness Walk, Palace Hotel." British Listed Buildings. Web. 20 December 2017.